Insta360 is launching a new camera on August 21: here are 3 hints! Remember the major news I mentioned yesterday? It’s a new camera from Insta360 and here’s a teaser photo! The background shows two lenses that seem to be side by side. This implies that the camera either has 3D capabilities and/or is a 360 camera with 6 or more lenses. In that regard, the Insta360 Titan is both – a 360 camera with eight lenses. So it’s possible that the new camera might be the Titan. Another possibility is that it’s a VR180 camera, which is a recent trend in the 360 industry. 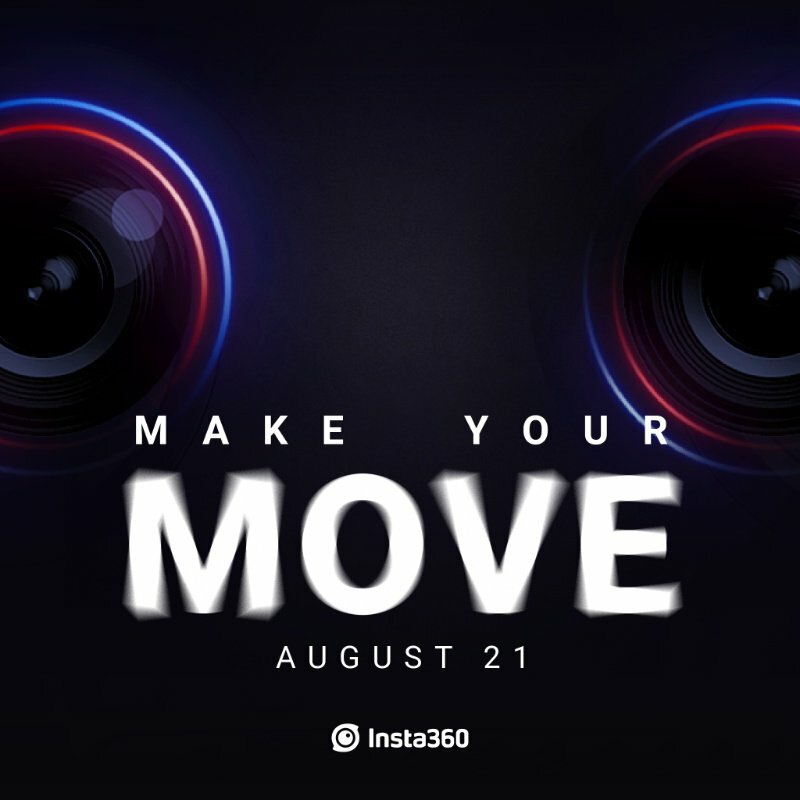 Another hint is the slogan, “Make your move.” In the video version of the teaser, the word Move is vibrating, which could be hinting about stabilization capabilities of the new camera. A third hint is that there are red and blue rings around the lens. This could be an allusion to 3D capabilities of the new camera. How about you? Let me know your theories in the comments! I’ll just sit back and wait. One thing for sure: If it really is a VR180 camera, right after Lenovo and Kandoa introduced theirs and Human Eyes announced theirs (not to mention LG’s and Yi’s announced since last year), the medium will start to be taken seriously and more manufacturers may join the crowd. One question I have, however: Will Insta360’s model be another low-cost consumer model or a more sophisticated one along the lines of the Insta360 Pro ? Yes I agree. We’ll see if it is indeed VR180. FWIW i think VR180 is not just a fad and we’ll see more vr180 cameras next year (my speculation only). Yes that’s a good question too about pro vs consumer model. we’ll find out soon! The phrase “Make your Move” may suggest 6 degrees of freedom. Probably a long shot, but wouldn’t that be amazing?! The 2 lenses is probably referring to 3D, yes. I hope it’s a competitively priced 180VR camera, with at least 5.7k, though the spacing of the lens in the teaser image doesn’t look eye width. I was also trying to judge if the lens was resting on a flat or curved surface but to me it appears they just photoshopped the same lens twice. I also hope there is no blue-red coloring on the actual product. “Move” does sound like a stabilization feature, if not action cam focused, but ironically “MOVE” is blurry, which probably wasn’t thought out graphically. Ohhhhh damn!!!! 2 days ago i purchased 360ONE in apple store the pack box extra…. i afraid…. that this new cam will be a sucessor of ONE??? Pfffffffff i hope no…… what do you Think? Or a more quality cam for equal level of gopro fusion? Is so so so more detailed and sharp gopro fusion? I still return my insta360 one with 14 days return policy…. or wait for new insta360 cam?……… i’m very confused….. The suggestion is that this may be a VR180 camera. However if it turns out being a 360 consumer camera, there will still be time to return your One if you prefer that new model. Really hoping it will be an upgrade on the resolution of the existing 360 one! Love the camera and all it can do but hate the quality! Only works on a small screen! Hi Coomby! I here you, and if reso is an issue, then I recommend Fusion (as long as your PC has a dedicated GPU). It’s not about a new cam. It’s about the Insta360 Pro so I guess new firmware introducing new features. Looking forward to it! Any leak of what camera will be presented tomorrow???? I can return my purchased 360 cam without open the bundle pack in apple store… until 23… better way… i’ll wait until tomorrow if is a consumer cam like ONE but better… i buy the new one!!! Return my unopened insta360 one!! It may be no more than a new firmware update offering better video stabilization. I doubt it would be an upgraded Insta360 One because the One is a relatively recent camera. Well i am sure the insta360 one will be updated soon, maybe in photokina? Nope ! Take a closer look… The V2 was a firmware upgrade. This is the Pro 2 which is a new camera based on the original camera. Farsight appears to now be integrated in the camera rather than a separate unit that must be connected under it. Good find! Yes thats it!